Neurotica uploaded extra MSN Display Pictures into the Charlie and The Chocolate Factory category. The movie -a remake of one of my favorite childhood movies- will be released in Belgium and France first on the 13th of July. It's also the debut of Plan B, Brad< Pitt & Jennifer Aniston's own little production company. Talking about The Pitts, here are some vicious MSN Display Pictures for "fans" who want to celebrate their recent breakup. I mean, they are Hollywood's most desirable singles right now, aren't they? Last but not least, I'd like to publicly apologize for not announcing the winners to our latest Display Pictures Competition and the Presidents Compo yet. They will be announced here on Mess.be on the 31st of March. To make up for the delay, I've added more prizes than planned... you'll see! And YES, there will be another DP contest. It'll be somewhat different though, so wait for the new rules (if you already uploaded new DP's before today, I'll automatically consider them as entries for the new competition). EXCLUSIVE: Dynamic Display Pictures look like THIS! Timothy has spotted a first example of the much anticipated Dynamic Display Pictures, a feature expected to be available as soon as MSN Messenger 7 goes final (in April). The Dynamic Display Pictures offered by official MSN content partner, Blue Mountain, will go under the name of Muggins. 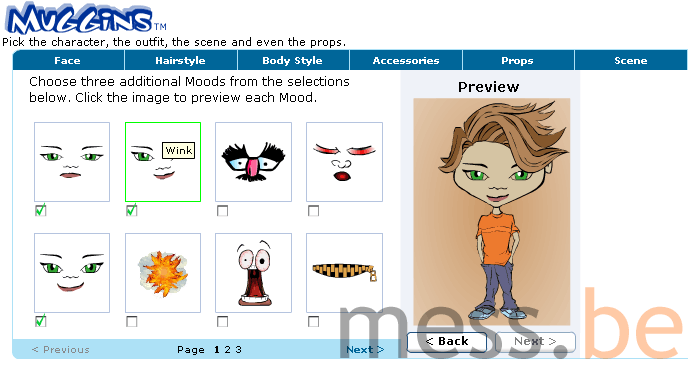 For $3 US you will be able to customize a guy or girl Muggin to your liking and import it into MSN Messenger 7. As mentioned in our FAQ on Dynamic Display Pictures, the use of emoticons or keyboard codes like :) and :( in a conversation will trigger the animated avatar to express corresponding emotions. Happy, Sad and Wink emotions come by default and per Muggin you can pick three extra moods from the following: Na na, Angry, Hair on fire, Shocked, Don't tell, Angel, Beer hat, Rolling eyes, Embarrassed, Sleepy, Confused, Thinking, Devil, Love and Birthday cake (see Muggins moods screenshot). To the right, you can see the dwergs Muggin, the first Muggin showed to the public ever! And yes, it animates! Seems like there's a significant change in yesterday's public BETA update after all. Via Bob, we learned about Mastaline's discovery that the new 0429 build authorizes the installation of extra winks again (Actions > Get More From Messenger > Winks, but currently still hidden from the user). Like we reported out earlier, only safe Winks from certified partners can be downloaded due to exploitability risks. One of these content partners is Blue Mountain, a company offers both paid as a few free winks as you can see in this screenshot. The public MSN Messenger 7 BETA was silently updated from 0425 to 0429. Currently only the English build is available, but other languages may have been added when you're reading this. We are unaware of any changes at the moment, but you'll be the first to hear about them. If you're into our MSN skins and patches I wouldn't recommend updating because chances are low they will be made compatible with this minor update. >> Download MSN Messenger 7.0.0429 here (English). Note that this is still an earlier version than the leaked MSN Messenger 7.0.0632 BETA and does not come with the Personal Message feature, nor the thumbnailed MSN Display Pictures in your contact list. By the way, we have added information to the iTunes part of our FAQ on the What I'm Listening To option. At exactly 3:57 GMT this morning, the long awaited Messenger Plus! 3.50 was released. After 5 months in development Patchou has unleashed the new, completely MSN Messenger 7 compatible version of Messenger Plus! with the long awaited new feature: Emotion Sounds. Custom Emotion Sounds allow you to send small sound files to each other; these can be anything from a small sound effect to the sound of you singing in the shower. If you haven't got your own sounds then you can always download a random clip from one of five different sections: cartoons and games, TV and movies, music, vocals and sound effects. Also new to Messenger Plus! 3.50 is the Configuration Wizard which helps you set up a range of features whilst giving you an insight into Messenger Plus! But don't forget the rest of Messenger Plus! 3.50, Custom Names and the POP3 Email feature have both seen significant improvements along with a few bug fixes, and some new commands. To celebrate this release of Plus! Patchou is giving away one Sony PSP a week until the end of April, and one brand-new Alienware laptop PC in a final draw. To take part in the contest, simply download and install the new Messenger Plus! version 3.5, and sign up for the contest! >> Download Messenger Plus! 3.50 now! >> Tell friends about Messenger Plus! 3.50 AND WIN BIG! Dutch foundation, De Kinderconsument, is going to educate parents and teachers about the Internet and telephone use of children. On the menu: lessons about text messaging (SMS), chatting and MSN Messenger. According to the organization's topdog B. Delver, some parents don't even know the difference! Participants will chat actively and even undergo a chat lingo dictation, in which the typical words and abbreviations will be brought up. Introducing parents to their kids' e-vocabulary is a hot topic lately. Only last month, Microsoft published a parent's primer to computer slang. Key points included: numbers are often used as letters (eg. 1337), letters can be substituted for other letters that may sound alike (eg. 5x1llz), the suffix "0rz" is often appended to words for emphasis or to make them plural (eg. pwnz0rz), non-alphanumeric characters may be combined to form letters (eg. our ascii nickname generator and slasher tip, both published OVER 3 years ago!) and finally, mistakes are often left uncorrected or adopted to replace correct spelling (eg. teh). The last key point brings me to the following: did yuo konw taht it dosne't mtaetr waht oerdr you put yuor ltetres in? Aoccdrnig to rscheearch at an Elingsh uinervtisy, tath's bcuseae we do not raed ervey lteter by ilstef, but the wrod as a wlohe. Taht mneas you dno't hvae to wrory aobut tipnyg erorrs druing Intsnat Measgisng, jsut as lnog as all the lettres are tehre! 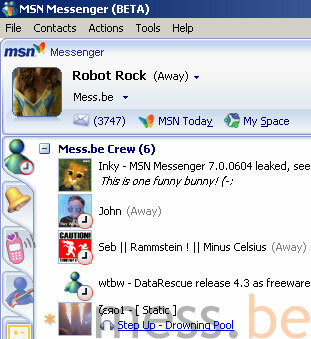 The third version of Mess Patch for MSN Messenger 7.0.0632 BETA (private) is here and it's the final one, we promise! :) Sorry to the unlucky few who experienced some problems with our second version (and thanks for reporting the bugs) but this one should work like a charm... all 28 tweaks inside of it! >> Download Mess Patch for MSN Messenger 7.0.0632 or use auto-update. 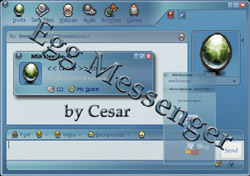 Cesar created an "eggcellent" full skin for MSN Messenger 7.0.0632 called Egg Messenger Skin and based on the Reluna theme by Bant and Manhattan's GANT icons. Polygamy and ad remover come pre-installed, just put the eggmessenger.exe file in your MSN Messenger program directory. >> Download Egg Messenger Skin for MSN Messenger 7.0.0632 BETA (private). Most existing MSN Messenger 7 skins will not be updated until the final MSN Messenger 7 release, expected in April 2005. The Netherlands is known for its supple drugs policy, but obviously the toleration is based on a proper education. Yesterday, the country launched an informational campaign on blowing, promoting something called Blowkwartet through radio and posters. 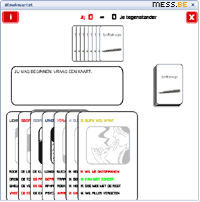 Blowkwartet is an "old maid" kind of card game for MSN Messenger, that contains facts and information about cannabis, weed and hashis use. It's written entirely in Dutch... and in the year 1992, judging by its primitive looks. >> Invite a friend to play Blowkwartet through our MSN Games Launcher. Microsoft's Channel9 team went down to Silicon Valley in California last month to meet with Omar Shahine, a lead program manager on the "Hotmail Front Door Architecture" team. His crew is responsible for HTML, DAV, POP, SMTP and a few dozen other kinds of servers. In a 25-minute video interview he explains things such as how your e-mail travels trough the Hotmail service and why spammers keep finding their way into your Inbox. >> Watch streaming video interview. >> Download video interview (81mb). Now that we're talking about Hotmail: "America's finest news source", The Onion, has published a fictitious story about recent Gmail convert William Ramsak who said that his "heart goes out to friend Kelly Oldenburg", who still sends e-mail through an MSN Hotmail account. "I feel so bad for you, needing to squeeze into 250 MB of storage space," Ramsak wrote to Oldenburg in an e-mail. "And I hate thinking of you sorting all your old e-mail, while Gmail automatically indexes mine so they are searchable." Ramsak then asked Oldenburg when he was going to "stop being a Microstooge and join Team G."
In a reaction to the increased awareness instigated by major websites, worldwide media and the press, the latest in the army of tiresome worms to hit MSN Messenger comes in a clever disguise. General rule of thumb: Do not accept a file transfer or click a hyperlink before you have discussed the actual content with its sender. Also, please educate your contacts about the MSN Messenger worm epidemic, for instance through your nickname. >> Say NO to MSN Messenger worms. The Netherlands-based SNS Bank is currently developing a payment system called Bill (not Gates) that works entirely through MSN Messenger. The concept of buddybanking, expected to go live in a few weeks with its own Messenger tab, is aimed at young people who want to transfer small sums of money over to online shops or even each other. An account at SNS Bank is not required to make use of Bill, there are no subscription or administration fees, receiving money is completely cost-free and so is online shopping. There's only a small additional fee deducted when transferring money to a buddy. I guess it will finally put the (mo) emoticon to good use, when you want to make clear to your buddy you're playing our Rock, Paper, Scissors Messenger game for hard-earned money. Did you know that adding new names to MSN Messenger can be worth a trip for you and five friends to anywhere in the U.S. (airfare, hotel and transport included)? All you have to do is fill out this form and add five contacts before March 25th. This sweepstakes is open ONLY to legal residents of the 50 United States and the District of Columbia, 18 years of age or older at the time of entry who are MSN Messenger account holders in good standing as of March 25, 2005. Good luck! A few days after its original release we decided to hand out an update to our free custom MSN Messenger 7 content installer: CustoMess RC2. Version 1.155.0.48 starts with a new setup, telling you how to launch CustoMess after it's installed. But more importantly and after talks with TheBlasphemer, we have built in support for the upcoming release of StuffPlug-NG (2.1.300 or higher, expected anytime soon). Users of current versions of both the popular plugin and our CustoMess software have to go through a long winded importing process if certain StuffPlug options are enabled. As soon as TheBlasphemer updates StuffPlug-NG 2, both programs will be completely compatible. Props to Timothy and TB for their cooperation! NOTE: This update is recommended to all users of the StuffPlug-NG 2 plugin. We will report about a CustoMess-compatible SPNG2 as soon as it's released. Because of a flock of analogue bug reports regarding two features, Rolando decided to issue a second version of Mess Patch for MSN Messenger 7.0.0632 BETA. - The Idle status is availabe only in English versions of the client again. With other languages, Idle and Away got mixed up. - Toaster has been replaced by TheBlasphemer's MSN Messenger music plugin for Winamp support in Personal Messages ("What I'm Listening To"). If you're experiencing problems you should download the updated patch by selecting Check for Mess Patch updates in the main menu or get it here. We're also looking for volunteers to translate Mess Patch into common languages other than English, Portugese (Brazil) and Dutch. E-mail mptranslate%rolandunderg.net (replace % with @). >> Download Mess Patch for MSN Messenger 7.0.0632 and start tweaking! >> Download Mess Patch for MSN Messenger 7.0.0405 (public BETA). If you like to know what the gang of regular MSN Messenger developers is up to, check out the new-born shared blog about Messenger ("and some other stuff") at msnblog.stuffplug.com. The following names of active bloggers will probably ring a bell: Dempsey, Inky (who recently lost his own MSN Space because of Code of Conduct violations, but happily regained it), jon, Rolando, Segosa and TheBlasphemer. Uber-programmer Patchou is listed as well, but he has yet to make his debut post and he just made his first post.